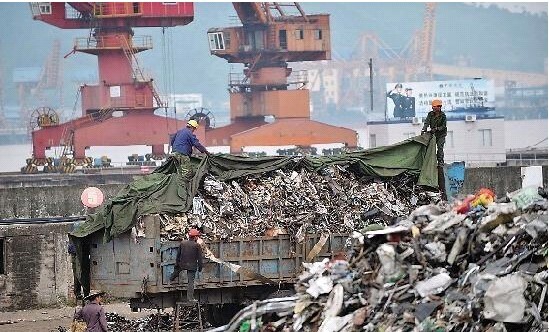 Shanghai customs officials said Thursday they seized 6,000 tonnes of waste tailings in March amid a crackdown on illegally imported garbage. Eight people have been detained in two cases for allegedly attempting to smuggle the tailings under fake documents that labeled them as metal ores, a customs official said. The seizure came after Shanghai launched "Operation Green Fence" in February. Officials have detected excessive amounts of arsenic and cadmium from the tailings, which could have caused contamination if processed by small refineries in China, said Hu Licong, a customs official in Shanghai. Hu said the tailings were imported mainly from countries in western Asia and eastern Europe. Shanghai's customs also revealed on Thursday that they have also intercepted 115 tonnes of waste tires, which China has banned from import over pollution concerns. Launched to strengthen supervision and crack down on imports of banned waste, the campaign has seen 383 containers of foreign waste seized for violating Chinese regulations. Customs data shows that the busy port of Shanghai handled imports of solid waste with a total value of 414 million U.S. dollars in 2012, up 3.2 percent year on year. Chinese law on the control of solid waste bans imports that can not be used as raw materials or be recycled by harmless means. High profits, however, have fueled smuggling, which is often conducted by conspiring with overseas organizations.